It's War! Arm yourself with classic Japanese weaponry and face relentless forces in massive combat. 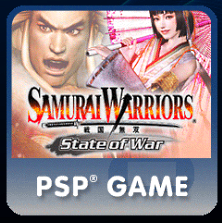 Set amidst Japan's most volatile era, Samurai Warriors: State of War gives you control of famous samurai and legendary ninjas, and engages you in an ever unfolding war. Comes complete with a dynamic, full screen display, new stories, competitive Vs. challenges for up to 4 players and more.